Nigerian Navy officials raided a warehouse at Ogbogoro community in Port Harcourt yesterday following an intelligence tip off. On arrival at the site, they found several storage compartments with petroleum products suspected to be Automated Gas Oil (AGO) popularly known as diesel. The diesel was stored in more than 20 compartments and large polythene bags, and each compartment had about 100 storage drums, each containing 350 litres of illegally refined diesel. “The drums and polythene bags contained an estimate of about one million litres of stolen diesel. 5 men operating the illegal warehouse were arrested while 15 others fled the scene. 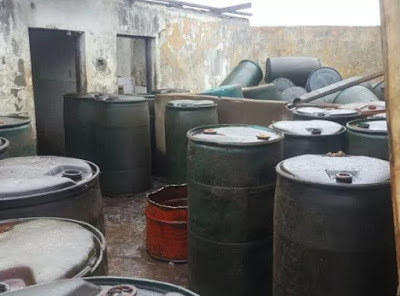 This is the Depot of stolen Diesel, am quite sure if proper investigations is carried out, you will be surprise to find depots of stolen Fuel, Kero while people surfers in the town for lack of these products. I can reliably inform us that whenever you see the Nigerian Navy act like this, or the JTC burning illegal refineries, just know that there was simply a misunderstanding between the criminals and them. Never make the mistake of thinking that they are just dicovering the illegal deals. I speak thus because I have seen things in Rivers State. Corruption has eaten very deep into this nation whether we admit it or not. The very first day I saw those illegal refineries, I was shocked beyond words. I saw guys, the engineers, walking about stark naked inside a thick bush where they sited their refinery. They were as black as a demon, I guess due to the heat they had to face daily, from the flames, the oils, as well as from the sun. Hundreds of buyers were coming coming with their vehicles to buy. It was just a very busy place. Real hustle and bustle. The interesting par of it now is that the JTF, the men of civil defence, and some other policemen station themselves at intervals, collecting money from every costumer going or coming. The main guys that do the deals pay their dues as well. It is only when those guys fail to meet up with their own side of the bargain that you hear that the JTF struck. Meanwhile they have been eatin and wiping their mouths. Metu, you are 100% correct. I know these people very well. And we are crying for fuel. When criminals are drilling it illegally. Oh Nigeria has been murdered by corrupt individuals occupying it. O boi ! dis pple re really serious and determine bussines thieves. imagine hw patiently and calmly dey arrange d tanks 2 be in full bunk b4 disposal..
unfortunately d law has caught up wit u…it’s best 2 stay away 4rm crime it cause more damage dan help. Kudos to our navy officer. If you share the gala you share the loot dawelites (long suffering people of Nigeria – the wailing wailers) will be less inclined to engaged in such activities.